Watch how Reinhardt’s plays the chords and compare it to the other guitarists. (You can find out why he has to play that way here). Bonus: Stéphane Grappelli! 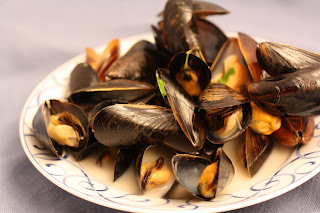 Are Moules marinière, mussels in white wine, the “fast food of the gods”, as this blog, Mastering the Art of 10 Minute French Cooking, says? I think so! And even if you don’t, if you like shell fish, you will like this recipe. The recipe I use, from Lucy Waverman, is slightly different and uses a cup of white wine and a cup of water. Instead of the scallion, it uses four cloves of garlic thinly sliced and two onions chopped. (You could get by with one.) As for herbs, it uses two dried teaspoons of thyme, which I really like. Finally it uses 2 pounds of mussels. However you want to make it, really, it’s the combination of white wine, herbs, and onions that create a wonderful broth and the means to steam open the mussels. Feel free to experiment. While the mussels are great all by themselves, if you want something to go with that, frites, or at least a good bagette to soak up all that delicious liquid. Finally drink the same wine you cooked with. However, I came across this version by Sting on the sublime music show from the 80s, Night Music. Sting, combined with David Sanborn and with some other great musicians, perform a great version of it as well. Your first responsibility as a great leader is to stabilize the debt. And if you click on that link, you will see what choices you have in front of you. Ross Douthat an American right of centre commentator at the NYTimes.com, has made his choices. You can go to the stabilize the debt site and make yours. If you are going to be honest, you should make hard choices and reflect that if you are to the left, you will have to support left-wing choices that add to the debt. Likewise, if you are right-wing, you will have to make some right wing choices and that too will add to the debt. Anyone who thinks they can just make choices that reduce the debt regardless of political pressure is not ready to be a great American politician. Alot of people are using ReclaimPrivacy.org, a Facebook Privacy Scanner. I’ve tried it and it’s pretty effective. It will give you a rundown of where you may have potential exposures, and try to take action to correct openings you may want to close. Highly worthwhile to check this out.